Every variety of honey is as unique as the flowering plants the bees visit. Tropic Bee added just a hint of natural fruit essence to create Citrus Honey with Key Lime or Tangerine. Palmetto is a great source of health supplements. 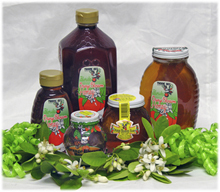 Tupelo Honey is one of the world's rarest honeys with the sweetest taste. BeeRom is the Mixon Apiary producing local Bradenton Honey selections.